So my tenure as beekeeper has come to an end. Rather abruptly, I might add. Last weekend bald-faced hornets invaded my hive and even though my guard bees fought valiently—there was a massive swarm of agitation happening at the entrance of the hive—it appears the hornets have won. This week most of my bees are gone. So are about six frames of lush, unharvested honey. Lucky for me, I had harvested my share of honey the week before. Those unharvested frames, those I left for the bee’s winter feed; those were my “reinvesting and saving portions of the harvest for yet another season of growth.” A season that apparently is not going to happen. Yes, I’m disappointed. The nurturer in me feels bad, like I somehow let down my bees. But my disappointment isn’t overwhelming and I’m choosing to relish the sweet side. Being a newbie, I allowed myself low expectations based on the many challenges facing today’s beekeepers. I knew this would be a season of learning and, wow, I’ve learned a lot. All summer I enjoyed watching my bees forage from one group of plants to another. I became conscious of the summer’s detailed progression in ways I previously hadn’t observed. And honey! Just look at that sweet, golden honey! I hadn’t anticipated harvesting any this first year, but those little troopers worked so hard to share. As a beekeeper I’ve had a temporary setback, but not for long. Next spring I’ll be ordering more bees and another summer of fun! In the meantime, I’m interested in this organization: The Honeybee Conservancy. The Honeybee Conservancy is a non-profit organization responding to the bee crisis. Check out its Sponsor-A-Hive program, which puts hives in schools and community gardens across the nation. Think of the educational opportunities! The pollinating potential! 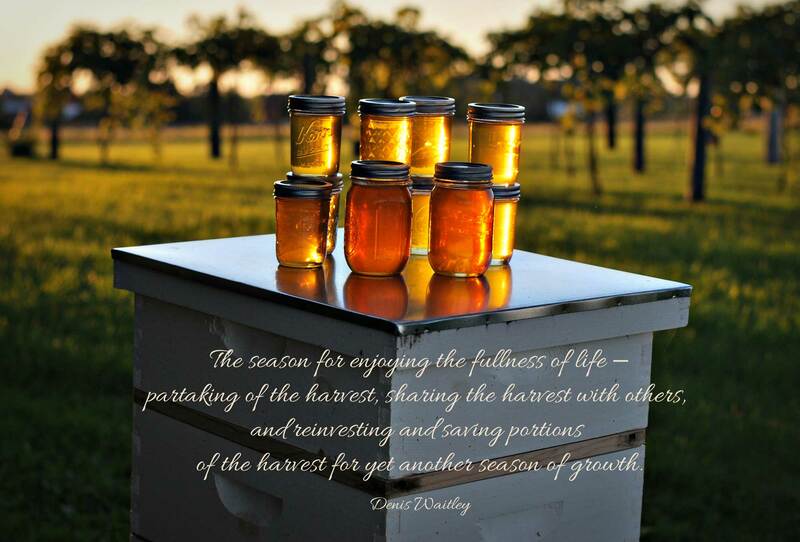 The Honeybee Conservancy is a way to “share the harvest with others” and reinvest portions for “yet another season of growth.” Writer Denis Waitley says it so well, doesn’t he? Care to donate? Currently, a $5000 grant is matching every dollar donated. Want a hive for your school? The deadline for registration is November 11, 2016.